Celebrating our local customers. We bring to you Monday Madness! Pop in any Monday and find amazing new items marked down just for the day. Everything from tee's to clothing for tots. Stop by to check out our newest savings. Sale every Monday through August! This week's t-shirts as low as $5 !!! 50 - 75% off select styles! ...when you buy a gift card for $500 of services to be used whenever you like, receive an additional $50 for free. Now's the time to take care of yourself and SAVE! Use it to try a new Ayurvedic service or for a consultation with Dr. Sherri or a series of acupuncture sessions with Zaachari and Tatianna. Call us at 843.725.0217 to get your gift card now. No worries, You didn't miss it.... this time we get to keep all those fabulous boots for the rest of the month. On Thursday, Kitty dropped off 20 of her favorites for Seeking Indigo to keep... Pop on over to take a peak. And it just keeps getting better.....her new jewelry collection just arrived today. Included in her collection are some amazing new items like her signature vintage Buddha necklace, an authentic Milagro necklace (I've got the matching earrings that haven't left my ears for over a month) and a host of collectors items including vintage peace sign earrings and cool $40 fish earrings that everyone is raving about! Can't find these goodies anywhere else!!!! Lexy's Fashion Pick of the Week! The Dreaming Tree Feather Earrings featured at Charleston Fashion Week now at Seeking Indigo! This week, I'm especially excited about our collection of feather earrings, made by local designer and friend Sarah Poe. Her collection, The Dreaming Tree, "was born out of a passion for beauty in nature and a free spirited style that inspires each of us to invite a little magic into each day." Sarah's designs, featured in Charleston Fashion Week 2011, incorporate hand-gathered feathers - from roosters, chickens, pheasants, and peacocks - and vintage charms and beads to create truly unique, absolutely gorgeous earrings. I've got three pairs! Very bohemian, very ethereal, very lightweight (duh - they're feathers! ), completely sustainable, and so much fun to wear. The Dreaming Tree collection is available exclusively at Seeking Indigo, so be sure to stop by and have a look. See you soon! Take your meditation practice to a new level! Learn how to string your own mala (prayer) beads, for yourself or as a gift for a friend. $35 covers the cost of the workshop, 108 Native Rudraksha seeds and semi-precious stones for marker beads. Delve into an ancient tradition as you string with intention and enjoy the opportunity to integrate your mala into a daily practice. Due to limited availability and supplies, we ask you to reserve a spot in advance. Tej Thompson has been certified to teach yoga and meditation since 1998. She has certifications to teach beginner and intermediate Hatha Yoga from the Integral Yoga Institute in Virginia. Her advanced Hatha teacher certification was awarded by the Nosara Yoga Institute in Nosara, Costa Rica in 2002. Her Kundalini Yoga teaching certificate was earned in Punjab, India, 2004, from the 3HO organization. Tej also makes mala beads as a side business and conducts many mala workshops throughout the city. Regional Artist Kitty Siegel returns to Charleston for round two of her Vintage Cowboy Boot Extravaganza. Join us for a trunk show featuring over 70 pairs of authentic one-of-a-kinds, with styles for both men and women starting at $80. Kitty, who started making and selling her saint bracelets and vintage charms in our boutique, is now a bigger part of the unfolding Seeking Indigo vision. We are preparing for the launch of another new concept as one corner of our store becomes a vintage, soulful "shop within a shop." Because what's old is new again! Thurs, Jan 27th at 6:00pm. Always the style-setter, Charleston Magazine rounded up a beautiful collection of stone accessories for their Style File Feature, "Rock Stars". Included in the roundup was Dara Ettinger's beautiful oversize amethyst crystal ring set in 24K gold, $85 at Seeking Indigo, and Dara's “Bridget” oversize chalcedony drusy ring set in 24K gold. The beauty of nature and her surroundings inspire Dara's work, applying simplicity to her aesthetics, and letting the materials speak for themselves. Her stones have many spiritual properties, imbued by their owners, and each one is a conversation piece on its own. The new Satya jewelry line as featured on the runway at Charleston Fashion Week!!! Satya Jewelry works with the energies of the body to promote well being. It is a yoga inspired line that you can wear anytime. From lotus earrings to the tree of life necklaces, you will find something you can not live without!!!! 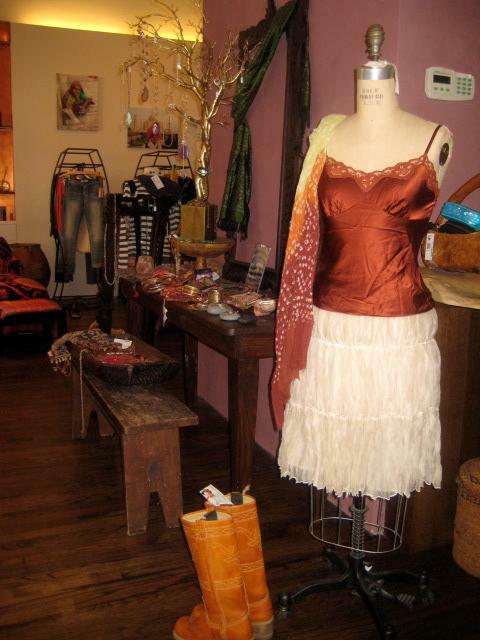 Come in and check it out at Seeking Indigo. Journal Entry: Seeking Indigo rocks Charleston Fashion Week - but it was no small feat! Talk about down to the wire. It was March 15, 4 days and counting, and our new exclusive Seeking Indigo line was caught in customs...in transit from India to Charleston for Fashion Week. This was a big lesson in trusting in the universe. As is with life, everything works out exactly as it should but learning to take a deep breath and let go is most difficult for those Type A personalities that want to be on top of every detail. It turned out that we were blessed with a shipment that arrived just minutes before our fitting AND count our lucky stars; everything was produced by our new manufacturer exactly to our specifications. When depending on suppliers oveseas, so many things can go wrong. But we were fortunate this time around, the angels were with us and everything went exactly right!!! Hats off to a team that then pulled it together in the 9th hour and all came off without a hitch. A big thanks to the universe as well for cooperating! The must have accessory by Dara Ettinger at Seeking Indigo!!! The ring is the must have accessory for spring. Darra Ettinger features one of a kind natural stones in gold and silver - perfect compliment for any spring look. Come in and get yours today at Seeking Indigo today. All are priced under $100.